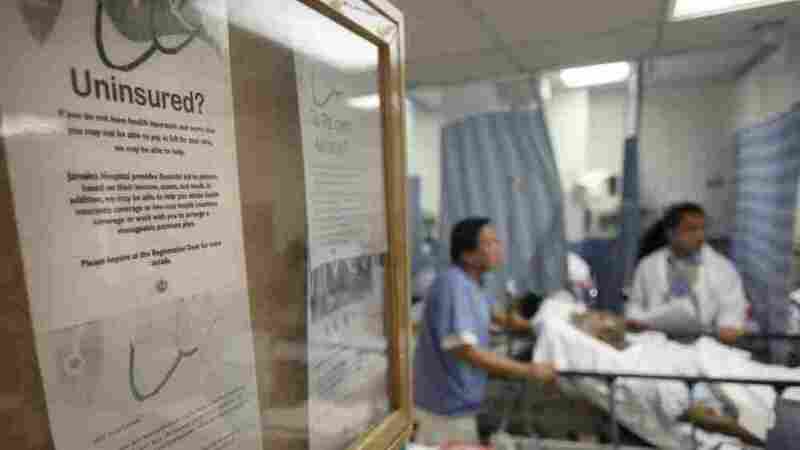 Uninsured Will Still Need The Money To Meet The Mandate : Shots - Health News While the Supreme Court considers the legality of requiring individuals to purchase health insurance, others are questioning the economics of the mandate. Some worry that, even with government subsidies, it may be difficult to find the funds to pay for health insurance. On Tuesday, the Supreme Court hears its second day of testimony about the Affordable Care Act. At issue is a central tenet of that law: whether it's legal to require individuals to purchase health care. But apart from the legal debate, there are questions about the economics of the mandate. Some — like Peggy Bodner of Portland, Ore. — worry it may be difficult to find the money to pay for health insurance, even with government subsidies. Bodner lost medical insurance when she lost her job three years ago. She has since found part-time work at the Oregon Zoo, but it pays half as much as her old job and doesn't offer health benefits. Despite being 41 and healthy, insuring herself under the most basic plan would cost at least $100 a month — more, Bodner says, than she can afford. "It doesn't factor in the fact that I'm a nonsmoker, that I eat a balanced, low-fat diet, that I walk for exercise," she says. "None of those things are calculated in. And I'm like, 'OK, well what kind of a plan do you have for someone like me?' "
Starting in 2014, the law — if it's upheld — will require people like Bodner to get insurance. Oregon and all the other states will start running health care exchanges that match buyers with a selection of private insurance plans. The federal government will subsidize these plans on a sliding scale, which means people or families making up to four times the poverty level will get some help. But for Bodner, even with the federal subsidy, a middle-range plan would still cost well over $100 a month — too much, she says, given her income barely meets her needs right now. How Many Americans Would State Health Care Exchanges Serve? "To try and put another $100 or something like that into the budget, either something would have to go, or I would just be like, 'I can't afford this insurance; I'm not taking it,' " she says. Under the new law, Bodner must either buy a plan or pay a fine that escalates every year she doesn't get insurance. But unless the penalty exceeds the cost of insurance, she says, she would probably just take the penalty. Bodner's dilemma strikes at a critical question: Will the estimated 16 million people who will be required to buy subsidized insurance under the mandate actually do so? Success of the law, after all, depends on the participation of all the key players. In order for it to work, states have to set up the exchange, insurance companies have to offer plans, and consumers need to be motivated to buy the insurance. Simply put, insurance works better when it involves large numbers — that way, both the risk and administrative costs can be distributed across many participants. Alan Weil, executive director of the National Academy for State Health Policy, acknowledges everyone won't immediately sign up. "There will be people who look in their pockets and say, 'I would love to be insured, but even with this subsidy, the amount that I have to pay is more than I feel I can pay,' " Weil says. "But the overwhelming response is going to be 'I finally have coverage within reach.' "
Weil says that just as other government medical programs became more popular over time, he expects people will warm to this one. Without the mandate, however, too many would opt out while a disproportionate number of sick people would opt in. According to Weil, that would destroy the system's economics. "Remember, we've also eliminated pre-existing condition exclusions and the higher rates people pay when they're sicker," he says. "You put all of those things together and you say, 'We are going to make coverage more affordable.' And most people will respond to that. Because we've done that, we really do need everyone participating. And so we need the mandate." That should be an easy sell to Jordan Lund. During a brief period when his family wasn't covered, his son racked up a $27,000 emergency bill. Lund and his wife each have medical conditions, and they have also lost their jobs four times in the past year — facts that make Lund very aware of both the perils of not having insurance and the perils of having to pay for it. "If somebody doesn't have money for health insurance, they're not going to have money for a fine, either," Lund says. "So it's not a matter of you can't get blood from a stone." For now, he says, he's just hoping to hang onto his job so won't have to make a choice.